Orient. It is but essential that before we start to do something, we have to get oriented with the things that we’re about to do. Orientation is important as this would give us an idea on the stuff that we’re supposed to do. For first timers or those who’s going to be exposed on something for the first time, getting oriented is a must. In a company, orientation before starting to work is vital as this would make the workers familiar with or adjusted to the company’s facts, principles or situation. Once oriented, we could now start working with the things that we’re supposed to work on. And orientation doesn’t have to be done only once. It is better to conduct a re-orientation once in a while. Its purpose is to remind the workers of the policies and principles in a certain company, just in case they have forgotten already. This practice would make them more aware and familiar of the things that should and shouldn’t be done. And thus they could become good and well oriented workers. 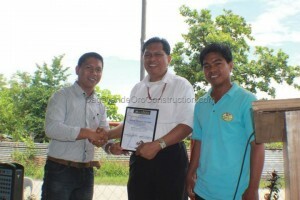 HomeChoice Planners & Construction Corporation conducted a Manpower Re-orientation last February 27, 2012. 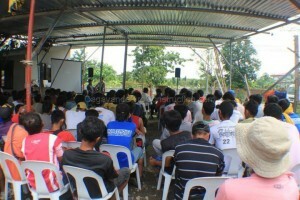 The said program aims to focus toward the concerns and interests of the construction workers. It is to re-orient them with the company’s rules and regulations, core values and working standards. It was a whole day event and it was held at the ‘bodega’, as what we call it. The first part of the program was dedicated for the bible study. The bible study was headed by Ptr. 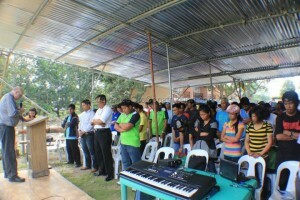 Lloyd Yana together with his First Assembly of God Church family. It is but right that before starting a program, we have to honor God’s grace. Allot a time for us to listen and ponder upon the word of the Lord. After the bible study, we then proceeded to the second part of the program. This part is allotted for the program proper. The first one to get on stage was a professor from Capitol University. He is the Dean of the Engineering Department, namely Engr. Franco Flores discussed about the safety measures in construction works. And we are so privileged to have him as one of the speakers. 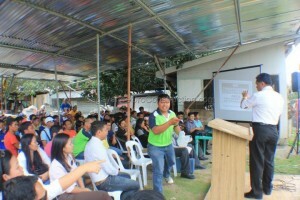 Then before proceeding to the next topic, Mr. Ian Jason L. Manrique prepared a film viewing to the workers. The film was all about the company’s history. After that, Ms. Valerie Joan E. Garcia then took the stage and talked about the company’s profile; its vision, mission and core values. After the topic on the company’s profile, the most awaited part of the program then came; LUNCH time! It was a satisfying lunch and we are all glad to see the workers enjoying the food we’ve prepared. Right after lunch, the program then continued. The next speakers were Ms. Geramie S. Morales and Ms. Melody Masangcay, they talked about the company’s rules and regulations and the penalties and sanctions. Our very own engineers; Engr. Mark Anthony Sangrador and Engr. Rhenan Redosendo, went up the stage also and shared about the working standards of the company. We also invited one of our clients, Mr. Jerry Newland to be one of the speakers. He reviewed the topics and discussed it to the workers in a summarized way. The last but not the least who spoke in front of the workers, was the head of our company, REB Robinson P. Masangcay or Sir Bens as what we call him, shared some words of encouragement, it is for him to motivate the workers to work harder and give their best shot. We are pleased with the outcome of the re-orientation program. The workers went home filled with new knowledge. They are now more aware and familiar with the company’s what to do and not to do. HomeChoice Planners is grateful with the workers attendance. Their participation is highly appreciated. We are also thankful to the speakers who willingly shared their time to discuss the following topics mentioned above. Indeed, it was a fun-filled day. Kudos to all!